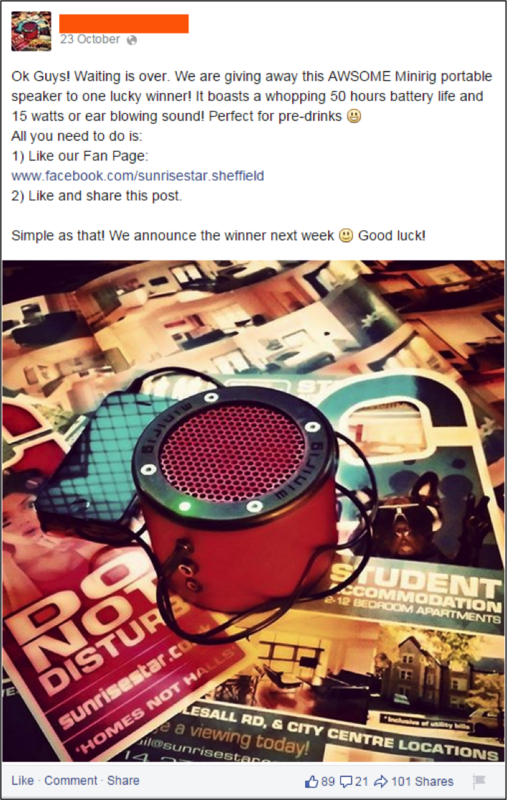 Running a Facebook competition to increase likes is a marketing tool which businesses have been utilising for a number of years. 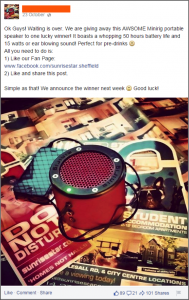 It is common knowledge that people love to get something for nothing, which on-paper, makes Facebook contests the perfect opportunity to grow fan bases and boost business. Simple enough, right? Well over the past few years Facebook have made various changes to the rules and regulations surrounding contests, which unfortunately will have left a lot of us feeling confused about what we can/can’t do. You may be surprised to hear that despite at one time being a common sight on your Facebook timeline, the classic “Like & Share” contest (see example below) has actually always been against Facebook’s rules due to its spam-like nature. Running these types of competitions may seem tempting, but seriously puts your page at risk of permanently being shut-down by Facebook. 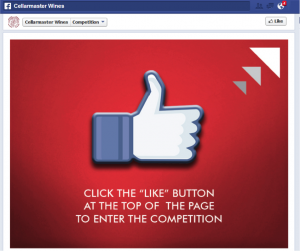 Although “Like & Share” contests have always been illegal, it was previously possible to have entrants ‘like’ a page in order to enter a contest by using a 3rd party app. This feature, known as “like-gating” did not allow users to access the entry page on a contest app without first ‘liking’ the page (see example below). Clearly this was a super-easy way for pages to grow their Facebook audience, especially since organic growth can sometimes be a slow process. The problem with this however, is the majority of people will be ‘liking’ the page solely to enter the contest, not because they are interested in the content of the page. Facebook has finally come to recognize this issue, and as a result disabled ‘like-gating’ as of November 5th 2014. So what does this mean for businesses? Admittedly it does seem as though Facebook are doing everything in their power to make virality difficult, which could arguably be a way of further incentivizing the use of boosted posts. But putting that aside, this change has happened, and businesses are going to have to adapt their social media strategies in order to work with it. Although at first sight these changes may seem negative for businesses, there are actually a lot of positive benefits if you look at it in a little more depth. Firstly, “likes” alone actually don’t mean very much at all. Think about it, your page may have gained 5,000 ‘likes’ from running a contest, but do these 5,000 people actually care about your brand? Are they going to be interested your content once the contest is over? The chances are they’re probably not. Having thousands of fans with no real interest in your business is probably going to mean a lot of people will hide your posts/unlike the page, which then has a detrimental effect on your organic reach to other users. As nice as it is to have a large audience, having 500 real fans who are actually interested in your content and willing to engage is marginally more beneficial than having 5,000 fans who only liked your page because they thought they we’re going to win an iPad. High engagement increases visibility, which in turn helps to promote organic growth. It may take a little more effort, but these changes should encourage businesses to run more creative and engaging competitions which actually relate to their products/services. For example, if your business is an online clothing store, giving away a store gift voucher would generate much higher-value entrants than giving away a cash prize. Entrants will clearly have an interest in your business and therefore have high potential to convert into future customers. But what about virality? How are you supposed to get your contest to spread if sharing is a banned entry method? Fortunately for us there are ways around this. Although Facebook rules do not allow entries to be given for sharing a link/post, you are allowed to give entries to users who successfully refer a friend via a shared link. You can do this by using a 3rd party app to run your contest. The idea behind this is that it gives users an incentive to share a contest, without being a direct requirement. The chances are that users are going to have friends on Facebook that would also be interested in entering the contest, the cycle then continues with these users, and voila! You have virality! So, should you use a 3rd party app? Or run your contest on your timeline? The answer to this question really depends on what you are looking to gain from the competition. If you are running a larger, high-value contest with aims of building your audience and gaining potential new customers then an app is probably the way to go. If your contest is smaller, with a lower value prize and you are looking to increase engagement with your current audience then go for a simple timeline contest. Can create a personalised experience, with more room for creativity in the contest requirements. Higher barrier to entry – as 3rd party apps usually require more information/actions from entrants. Remember the most important thing to do before running a Facebook contest is to establish your goals; from then you can chose the contest type that will be the most suitable. Combine this with ensuring your contest is relevant and engaging in order to achieve the best possible results and future success.